The Karoo is a semi-dessert area in South Africa. 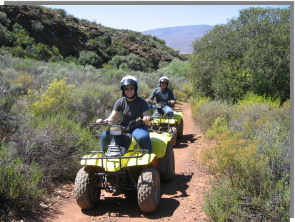 We have some of our trails in the Little Karoo. 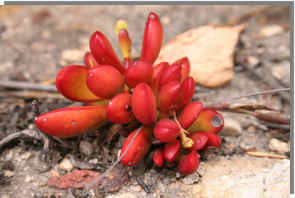 It is a very mysterious landscape that, on the first blink, is only a bunch of bushes scattered over an uneven plain, broken by what we call 'koppies' or little hills. When you get out of your vehicle and step closer, you will discover a very busy world, full of insects and interesting plant life. Sometimes we might find footprints of baboons and other animals in the little quad track that we use. This trail is suitable for the entire family, for couples or for teambuilding. You can go for 1 to 3 hrs in the Karoo, but the most popular trail is the 2 hr Karoo trail. You can hire our quads or bring your own.